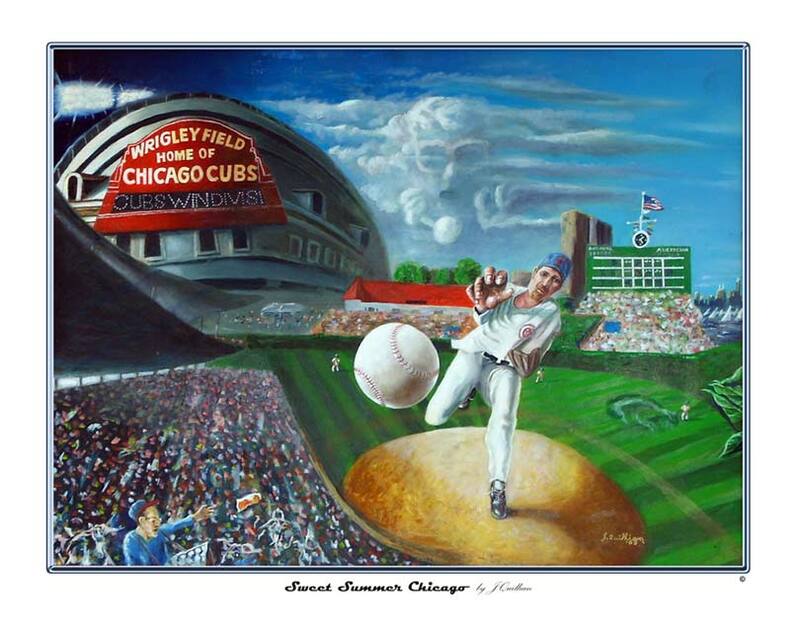 The first in a series of team sports paintings, SWEET SUMMER CHICAGO celebrates the artist's former neighbor and acquaintance, Harry Caray. Quillian frequently attended games where Caray lead the fans in "Take Me Out To The Ball Game" with his signature "seventh inning stretch" . Quillian, who lived six blocks from Wrigley Field, once appeared on the "Tonight Show with Jay Leno" drinking a vodka tonic during the entire run of credits from Harry Caray's restaurant. The original 30 X 40" oil painting was displayed for a year at The Drake Hotel in Chicago following two signings by the artist in the famed lobby. We were recently informed that the collector who now owns the work is considering placing the work for sale. 16 X 20" for $25 and 18 X 24" lithographs for $75 are available through this site. Artist J Quillian grew up with aviation as the son of FAA pioneer, Ruben M. Quillian. Quillian Sr. at one time was a manager of flight service stations covering urban and isolated stations in the Southeast and Southwest United States. To honor his father's career which began in 1939 when only five control towers existed nationally, JQ painted this four panel mural. During his year-long process of research and execution, he was reminded of his father's encouraging words for his talent at painting and sculpture. This 18 X 24" lithograph features over 150 pieces of equipment, 59 aviation pioneers and spans the entire 20th Century of aviation history. Such notables include the Wright Brothers for whom the work is named for along with Charles Lindbergh, Howard Hughes, Juan Trippe, and Amelia Earhart. 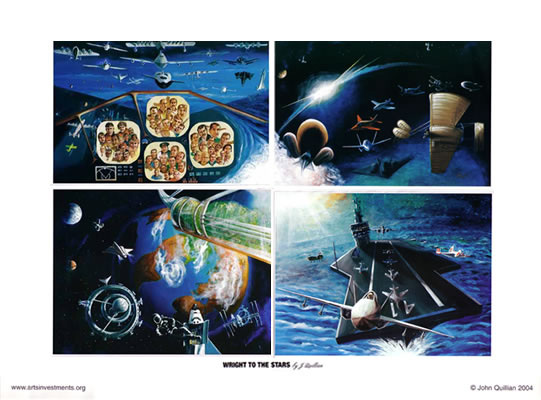 In 2005, Quillian was commissioned to paint a biographical portrait for American astronaut General Thomas P. Stafford's museum. 18 X 24" lithographs are available for $25 and also at wholesale to organizations or retail establishments. 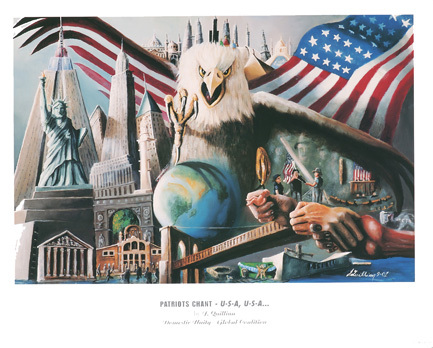 This emotionally charged painting was created during the week of 9-11. It was licensed for use by more than 100 companies and merchandisers. As a statement of American unity that has seldom been seen in the United States' 200-year history, Quillian feverishly created the painting and reproduced these 16 X 20" lithographs in one week. Only a limited number of the original prints are left and are available for $50, signed and numbered. 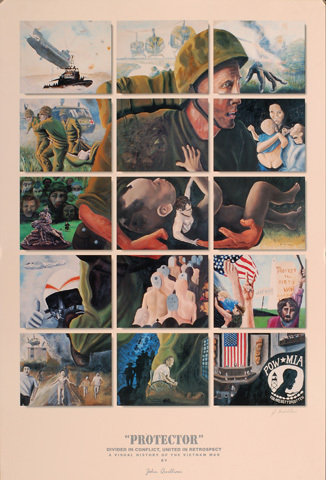 This reproduction of artist J Quillian's first polyptych mural traces the history of the Vietnam War through meticulous research and portrayal of the various branches of US military including representations of his service in the United States Coast Guard whom unbeknownst to many patrolled the rivers and coastline of Vietnam. Having learned the technique of painting in multiple panels (polyptych) from visiting Russian artists in 1988, PROTECTOR became Quillian's first mural. It was unveiled at a Dallas convention of Vietnam Veterans and brought out an outpouring of emotions from the attendees that has left an impression on Quillian's memory to this day. This 24 X 36" limited edition signed and numbered lithograph is available for $100. All listed lithographs are available through paypal, bank check or wire transfers.